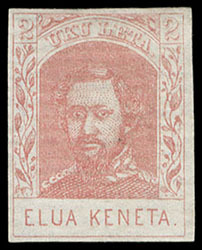 Hawaii, 1861, 2¢ pale rose, horizontally laid paper, o.g., lightly hinged, ample to large margins, bright color and fresh paper, Very Fine and choice, a premium mint example. 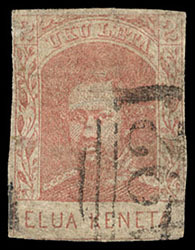 Hawaii, 1861, 2¢ pale rose, horizontally laid paper, showing an unusual slightly blurred impression, without gum, margins ample to touching frameline, F.-V.F. ; with 2010 P.F. certificate. Hawaii, 1861, 2¢ pale rose, horizontally laid paper, barred "A92" oval British Cunard Steamship cancel, couple tiny edge thins, otherwise Very Fine, very rare with only a few known. Scott No. 27 Estimate $600 - 800. 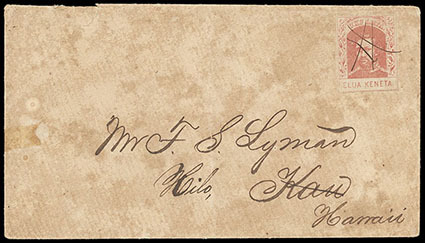 Hawaii, 1861, 2¢ pale rose, horizontally laid paper, ample to large margins, tied by manuscript cancel on interisland cover to Hilo; cover with allover topical toning, F.-V.F. 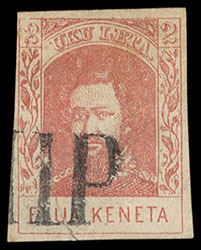 ; with 1972 P.F. certificate. 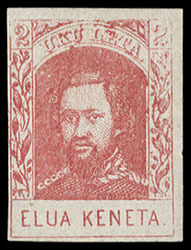 Hawaii, 1861, 2¢ pale rose, vertically laid paper, without gum, clear to large margins, bright color, Very Fine. Hawaii, 1861, 2¢ pale rose, vertically laid paper, 3 singles, tied by two complete strikes of large 9-Bar rectangular grid cancel, Very Fine, this large grid reportedly was used for multiples only, very rare and unlisted by Gregory, ex-Golden & Advertiser. Scott No. 28 Estimate $400 - 600. 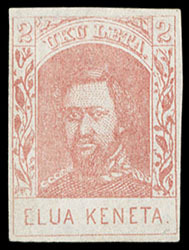 Hawaii, 1861, 2¢ pale rose, vertically laid paper, San Francisco "Ship" handstamp, clear to large margins, sealed tear at bottom left, Very Fine appearance, believed to be a unique marking on this issue; with 2016 P.S.A.G. certificate. Scott No. 28 Estimate $300 - 400. 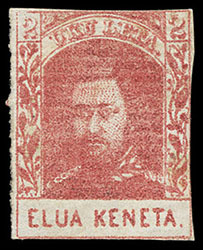 Hawaii, 1863, 2¢ carmine rose, vertically laid paper, part o.g., ample to large margins, rich color, Very Fine, a tough stamp so nice. 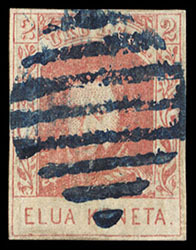 Hawaii, 1863, 2¢ carmine rose, vertically laid paper, bold blue thick 8-bar grid cancel, full even margins, Extremely Fine, an exceptional strike of this rare unlisted grid. Scott No. 28a Estimate $750 - 1,000. 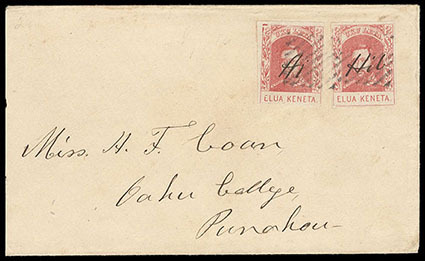 Hawaii, 1863, 2¢ carmine rose, vertically laid paper, two singles, tied on cover to Punahou by light square grid cancels, one with "HI" and one with "Hil" manuscript cancels; cover reduced at left, Very Fine, certainly a Unique Usage of Two Different Manuscript Postmarks. Scott No. 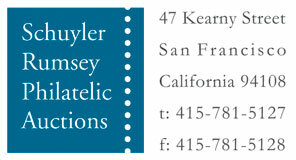 28a Estimate $2,000 - 3,000.